In a world of Cronuts, perhaps it's inevitable we have ramen-pho. Some Seattle chefs have been playing mad scientist with the concept for months, and now they're sure enough to list the fusion on their menus. In a world of Cronuts, perhaps it’s inevitable we have ramen-pho. Or should we say rampho? Phomen? Since last fall, I’ve been hearing all the buzz about pho chefs playing mad scientist in their back kitchens over this concept. Well, the ramen-pho fusion is creeping onto menus now. Kaarage Setsuna in Belltown does a “Ra-Min,” which they describe as having “a touch of pho,” while Phorale in South Park does a variation with a sous vide egg, garlicky pork belly and enoki mushrooms (though it’s still a work in progress). 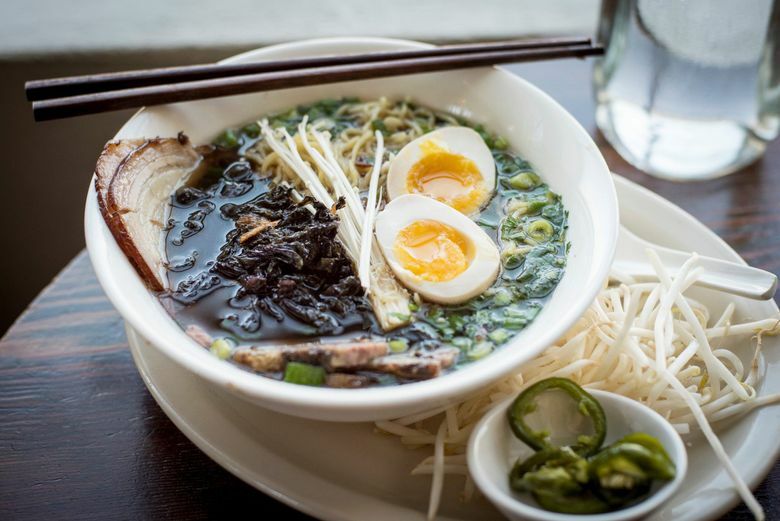 In east Portland, the acclaimed Noraneko features a “pho spice ramen” with star anise, cinnamon and pho condiments to go with its ramen chicken broth. No one has been more obsessed with this concept than Eric Banh of Ba Bar, which has the most popular ramen pho in the city, a pho beef broth that tastes like it’s been injected with a steroid of salty pork fat, served with wheat noodles and topped with a soft-boiled egg, smoked pork belly, roasted brisket and the umami punch of enoki mushrooms and seaweed. For two months, his cooks tinkered to find the right balance so that the bowl still had the DNA of pho but with some oink. It was no easy task: The rich pork-fat ramen broth kept overwhelming the pho broth, he said. The unexpected challenge was finding the right texture and seasoning of the pork belly and brisket to complement the ramen-pho soup, which took another two months of experimenting, he said. How is it? Well, California-based writer Andrea Nguyen, author of “The Pho Cookbook,” is a fan. If you’re not a pho or ramen purist and accept it for what it is — a salty, meaty Asian soup packed with umami — then you’re going to enjoy it. It’s a smoky soup with heft, best eaten with a squeeze of lime and pickled jalapeno peppers to cut into the fat. Ba Bar now offers pho ramen during lunch and dinner at both its Central District and South Lake Union locations.